Photo Tiia Monto via Wikimedia Commons. My friend spotted an unusual coffee table at the Portland Saturday market a few months ago. It was one of those knobby burl-type affairs topped with a sheet of glass. The identity of the creamy white wood mystified her. “Dandelion root,” responded the furniture maker when she put the question to him. She stalked off with scarlet cheeks, certain he was putting her on. When I first moved to Oregon, a few small dandelions poked their heads up through the bark dust in the yard of my rented duplex. No problem, I thought. I’d just pull them up. When one of the roots tried to drag me into the hole, though, as I was excavating around it, I decided I needed more authoritative information. I went to the neighbors. One assured me that these were indeed the same innocuous little plants that dot the yards across the country and that curl up and die when hit with Roundup. “Those folks don’t know how luck they are,” she told me. “Yes, they’re a little aggressive,” added the man across the street who had lost two fingers when a dandelion root lashed at him. Essentially I discovered that when folks in Oregon talk about ’lions, they don’t mean those cute, cuddly cats in the zoo. They’re talking serious killers. These botanical monsters resist poisons, drink herbicides for their health, and flourish in the heat of propane torches. 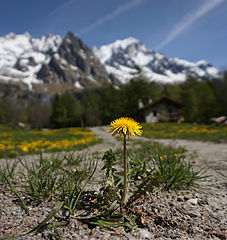 In fact, I have heard rumors that the Oregon National Guard is working with a local agricultural company to develop an even more lethal strain of the dandelions. The grapevine has it that these will be planted along the border between Oregon and California. A rudimentary intelligence bred into the fluffy yellow heads will allow them to recognize California license plates, at which time the coiled roots will lash out of the ground, snag the vehicle, shake out the occupants, and crush the car. I scoffed at the rumor when I first heard it, but lately I’ve wondered if some of the prototype plants may not have escaped into my neighborhood. There were some noisy dogs and obnoxious cats around when I moved in. But things are much quieter at night now, and the bark dust in the yard is disturbed less often by scratching cats. Just yesterday I watched the kids at the bus stop in front of the house. They were unnaturally subdued. There didn’t seem to be as many of them as usual, either. The few there were huddled fearfully in the center of the street, backs together, looking outward. They seemed to be peering at the nearby yards. Especially mine. What was that? That scratching noise outside? Excuse me. I have to sharpen my machete and check the yard.